From the first time that I heard of The Biggest Week in American Birding, a birding festival on the south shore of Lake Erie in Ohio, I wanted to go. I had planned to go last year, but professional obligations kept me from attending. This year I was determined to attend. I rented a little cottage right on Lake Erie very near Magee Marsh. I arrived rather late on Saturday evening, and I was pleased to have dinner with birding friends Dawn and Jeff Fine and equally pleased to see and meet other old and new birding friends. The next morning I woke up early and headed for Magee Marsh. I was looking forward to attending a photo workshop with Christopher Taylor. I had followed him on Twitter for four years. I am an admirer of his work, and I was anxious to meet him in person. 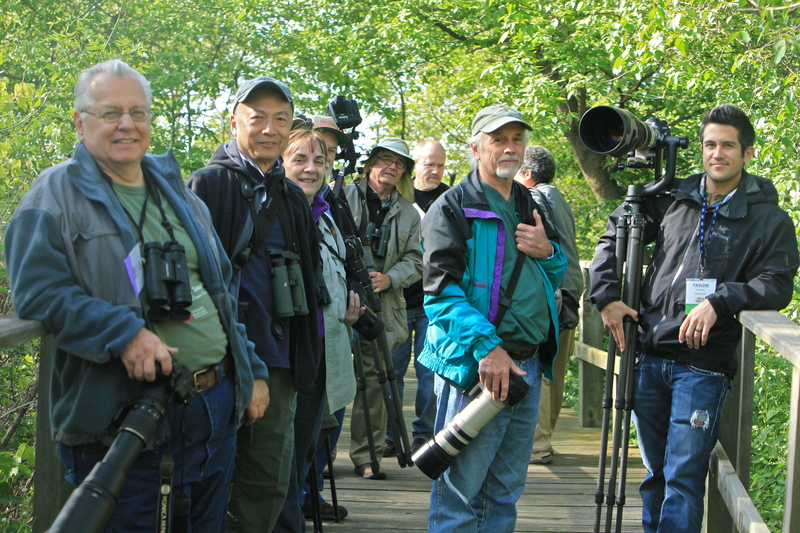 Our little group of eight photographers set out along the boardwalk at Magee Marsh, looking for warblers and other migrants. Christopher Taylor (far right) leads a group of photographers in search of migrants. There were many warblers in the trees, but many of them were in the shadows. This is a situation that I am not much accustomed to encountering in sunny New Mexico, and I struggled a bit to adjust my camera. I seem to have a certain effect on birds when I attempt to photograph them. This is the most common view I had of warblers on my first day in Ohio. This Palm Warbler was sitting prettily on a branch until I tried to photograph it. 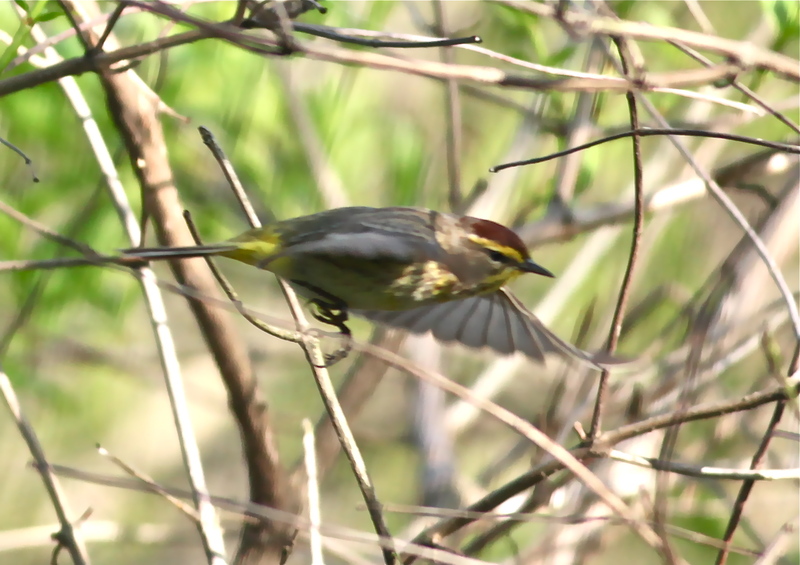 A Palm Warbler flees from my camera. 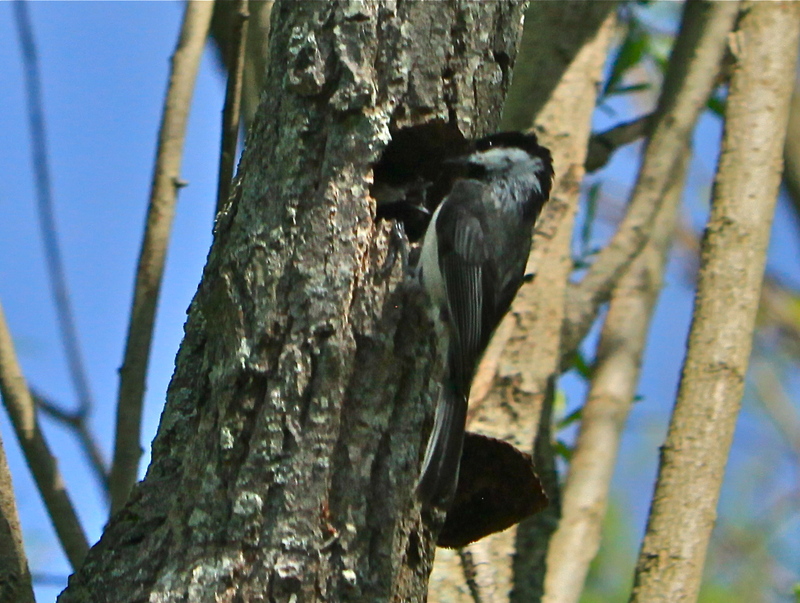 We spent some time watching a Black-capped Chickadee feeding a fledgling still in the nest. 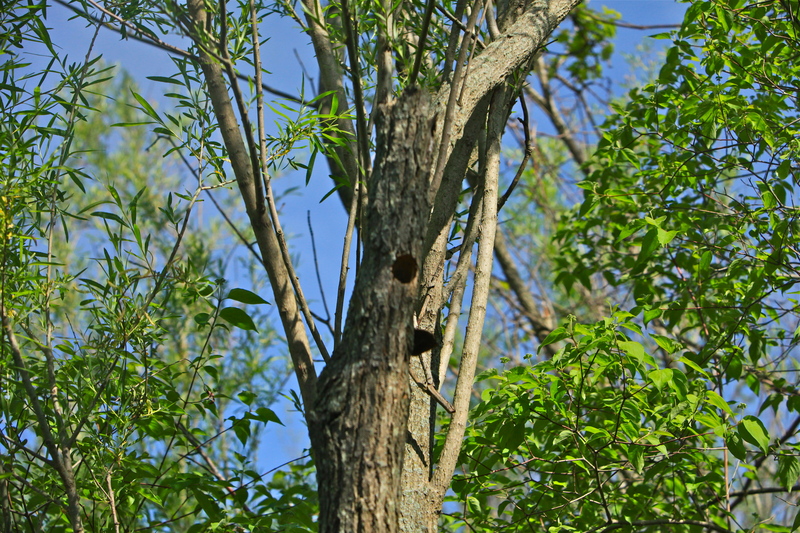 Here is the nest, which was right on the boardwalk. Do you see the hole in the tree? That’s the chickadee nest! 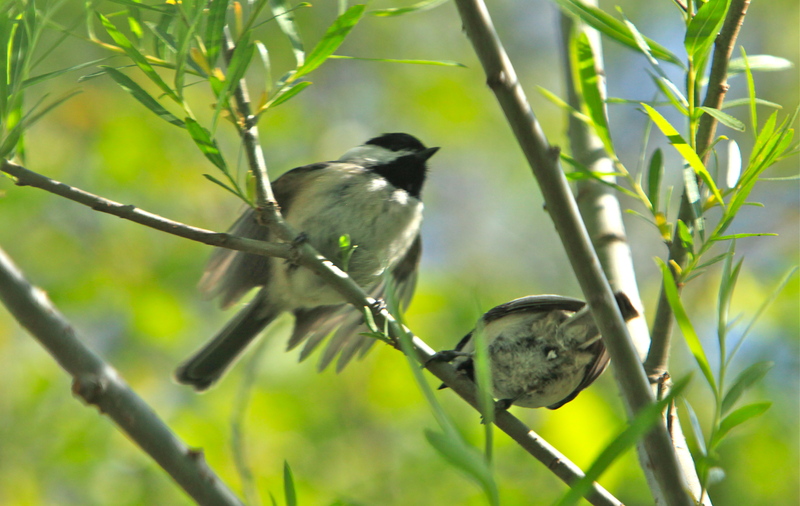 Black-capped Chickadee feeding a fledgling. 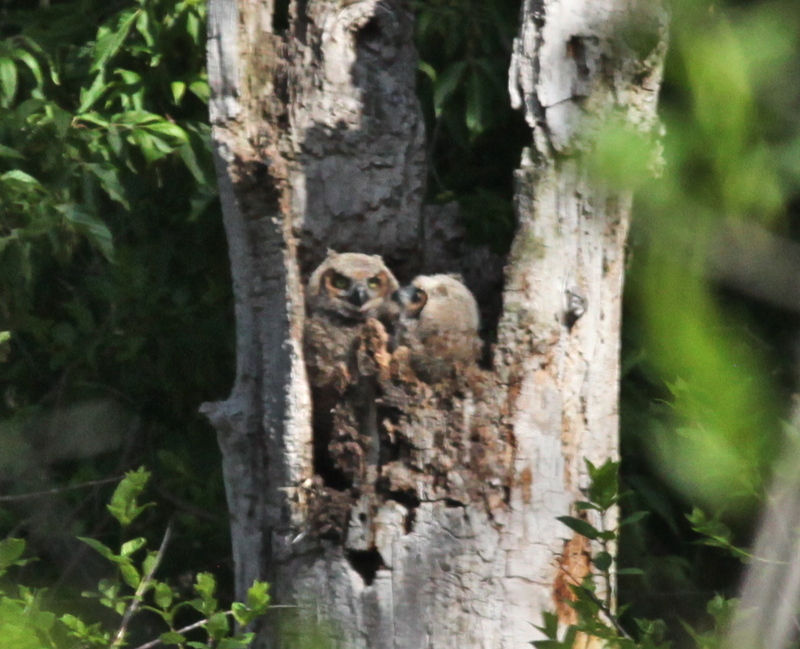 A highlight of the morning was seeing a pair of Great Horned Owlets that were almost ready to fledge. Of course, being a handsome, successful photographer isn’t only endless birds and admiration. There can be fallout from standing under trees filled with warblers. Chris Taylor is appalled that those lovely warblers would treat him with disrespect. Hi Lisa! Yes, I’m having a wonderful time. 🙂 It would be better if you were here. The birds are amazing! It’s something else to add to the list…..one of these days 🙂 The birds look, and sound wonderful. Looking forward to your next report. Keep having fun! It sounds and looks like so much fun!!! I hope to get there one year!! Terrific, Linda. I hope the warblers become more cooperative for you! The tree stump is a wonderful setting for the little owls. Hope you continue to have a great time with the birds and birding friends. Hi Scott! 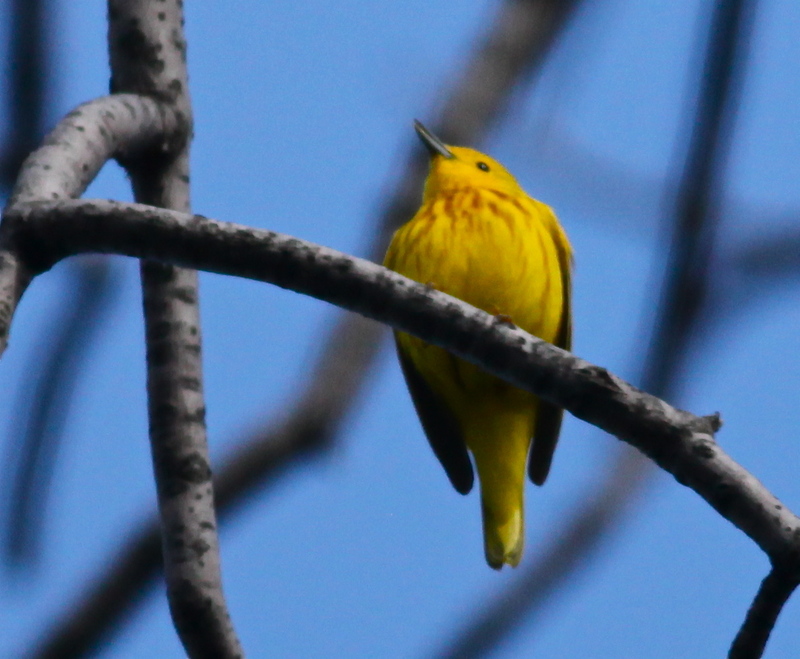 I’m developing a fine case of warbler neck and having a wonderful time. The warblers are getting more cooperative as you will see in my next blog post. Aren’t the owls adorable? I’m glad I saw them when I did, because they were gone today. Apparently they’ve fledged! The photo workshop was a fun time and a wonderful experience. I really enjoyed meeting you in person. 🙂 I still have a lovely photo of you with bird poop in your hair. ;-)I enjoy your humor and attending this great event with you..Keep these updates coming! Linda, sounds like you are having a glorious time birding. 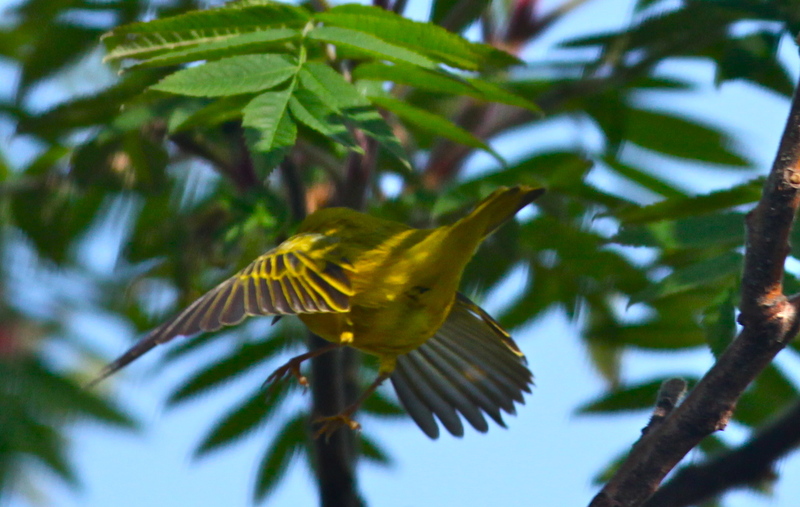 Warblers are never easy to photograph, as they flit around constantly. Every once in a blue moon I get a good shot. 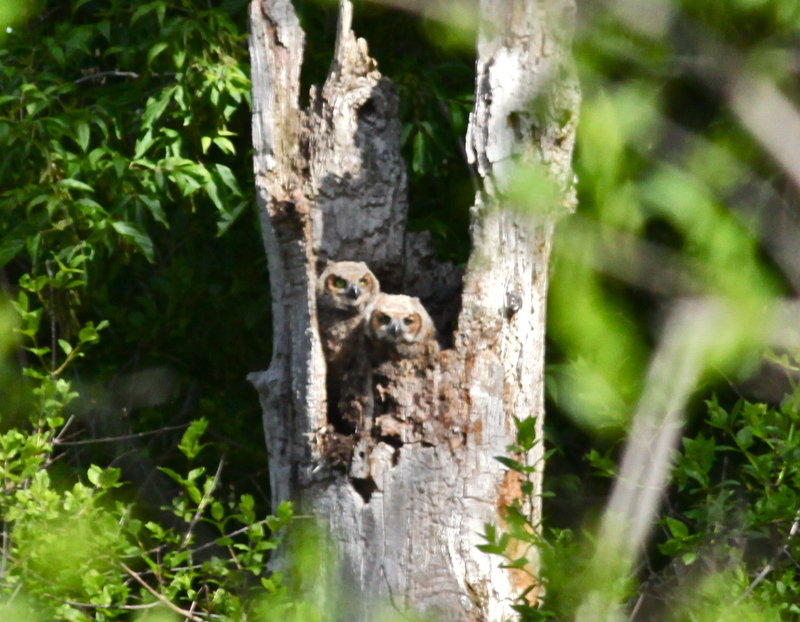 Oh my goodness, those Great Horned Owlets are so very precious! Wonderful post! Happy birding! A terrific post Linda! It sounds like everyone is having an awesome time seeing so many wonderful birds. Thanks Mia. We’re having a super time. It’d be more fun if you were here. You should definitely try to get to this one! !